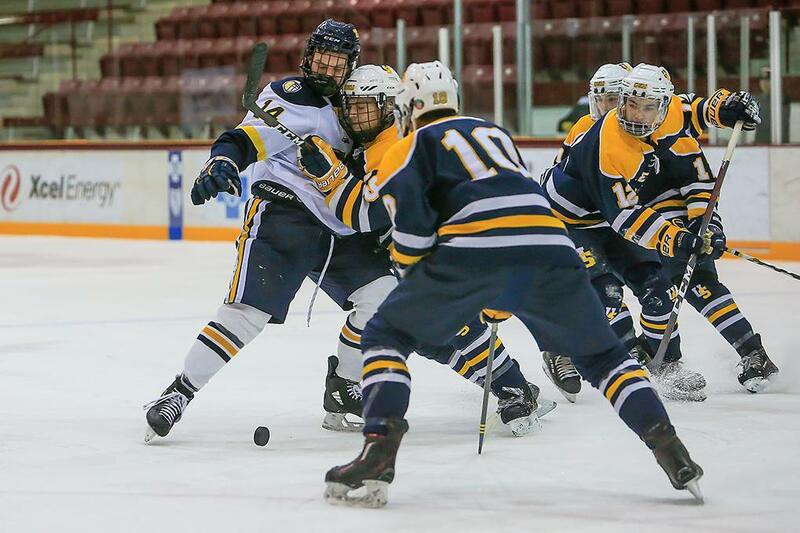 For two periods, the University School of Milwaukee controlled play in its Schwan's Cup Bronze Division championship game against Totino-Grace at the University of Minnesota's Ridder Arena in Minneapolis Tuesday. But despite a 38-12 advantage in shots, the Wildcats were tied with Totino-Grace 2-2. "We just had to stay positive on the bench in the locker room," said University School of Milwaukee forward Robby Newton. "We were playing well, but we had to just keep rolling." And the Wildcats did get rolling, scoring two goals early in the third period and adding a late empty-netter to claim a 5-3 victory. Newton and linemate Tyler Herzberg each scored twice for the Wildcats, who are now 10-1 on the season. 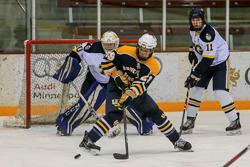 Totino-Grace had won eight of its last nine games before the loss. The teams played a scoreless first period, although the Eagles (8-4, 4-0) spent much of the period in their own defensive zone and were outshot 20-6. But Totino-Grace was whistled for a penalty just 45 seconds into the second period, and University School of Milwaukee took advantage as Newton scored 1 minute, 35 seconds into the period. When Herzberg combined with Newton to score on a nifty passing play just 1 minute, 4 seconds later, it appeared the Wildcats were ready to run away with the contest. That did not happen. Instead, Totino-Grace forced a penalty and got a goal by Jake Wacek at 12:23, just six seconds into the man advantage. Then, late in the second period, with the teams skating four-on-four, the Eagles' Kyle Heffron took a pass from Wacek near center ice and had a breakaway. Wildcats goalie Frank Fee stopped Heffron's initial shot, but the junior forward stuffed the rebound past Fee and into the net with 1 minute, 5 seconds left in the second period to tie the contest 2-2. 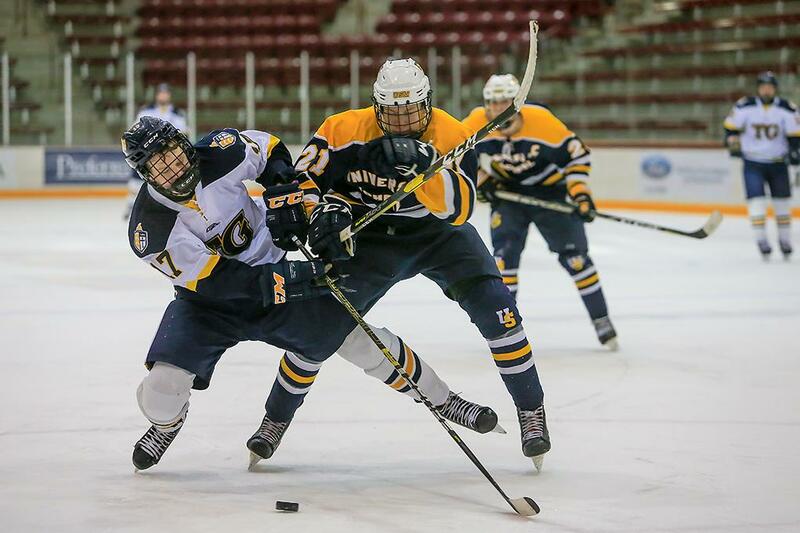 "They're a fast team and very physical," Totino-Grace coach Adam Sharratt said. "We capitalized on a couple of chances to stay in the game, and Jon Howe was amazing in goal like he always is." University School of Milwaukee came out flying to start the third period, and Sterling Cooke gave his team a 3-2 lead with a goal just 2 minutes, 11 seconds in. "That was an important goal because it helped us loosen up," Newton said. "We had the lead, and we knew all we had to do was play solid defense." Soon after, Fee was injured, and Patrick Kelly replaced him with 13:39 left on the clock. That's when Herzberg scored his second goal of the contest to give the Wildcats a two-goal lead. 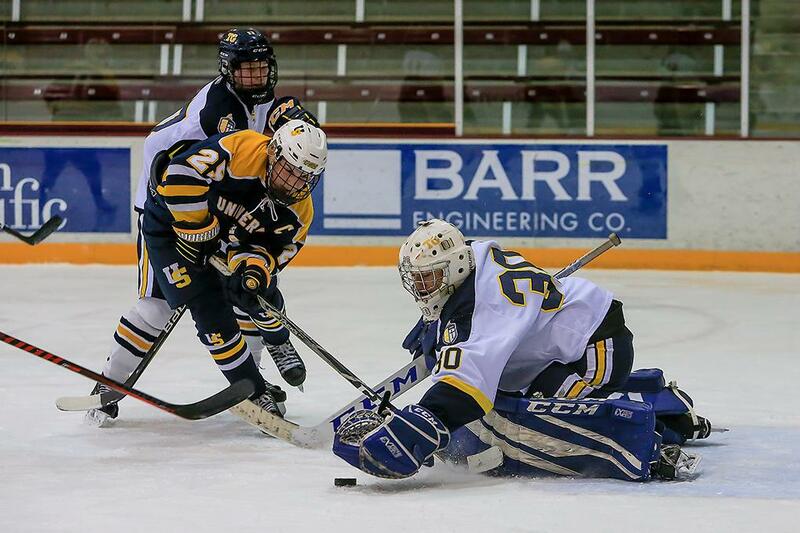 Outshot 48-15, Totino-Grace stayed in the game with help from goalie Jon Howe, who stopped 43 shots. The Eagles made it a one-goal game when Colin Neilsen scored on the power play at 12:26, but Newton found an empty net with 57.5 seconds left to seal the win. "We had chances to get back into the game at the end," Sharratt said. "But that's the best team in Wisconsin — and they showed it."